Mobile phone firms have been accused of cashing in on crime and terror after charging the police £8.7million a year to access data tracking information. The companies keep records of the times, dates, duration of mobile phone calls and the numbers contacted but not the actual content of conversations. They also hold crucial information about the whereabouts of a mobile phone at any given time – which can be accessed by the police to build up a picture of a suspect’s movements. The details were crucial in the conviction of Soham murderer Ian Huntley and Ipswich prostitute-killer Steve Wright and in identifying those involved in the failed 21/7 terrorist plots in London. 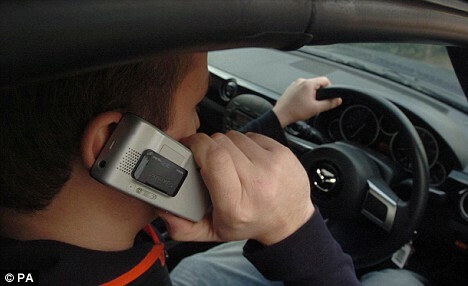 But Vodafone, O2 and T-Mobile charge a fee for seeing the data – with the cost running at about £170,000 a week. This is in addition to £8million the Home Office already pays telecoms firms to store information on their customers for at least a year so it is available to the police and MI5. Police can see the phone records without having to apply to the courts, with senior offices issuing a Section 22 notice under the powerful Regulation of Investigatory Powers Act. The process has become an everyday part of police inquiries and many forces and MI5 have automated systems to retrieve mobile data – prompting calls for the service to be free of charge. Last year, Section 22 powers were exercised more than 500,000 times. – A human rights crime in Gaza by Ex-President Jimmy Carter. Carter also condemned Israel’s blockade of the Gaza Strip as “one of the greatest human rights crimes now existing on Earth,” according to the Agence France-Presse news agency. Gaza is being forced to pump 77 tonnes of untreated or partially treated sewage out to sea daily due to the Israeli blockade of the coastal territory. The fear is that some of this is creeping back into drinking water. “The health of Gaza’s 1.5 million people is at risk,” Mahmoud Daher, from the UN World Health Organisation (WHO) told IPS. The results revealed that three areas in Gaza and one area in the Rafah governorate (30.8 percent) are polluted with human faeces (Faecal Coliform) and animal faeces (Faecal Streptococcus), and three areas in Gaza city (23.1 percent) are polluted with animal faeces. GAZA CITY, Gaza — Half of Gaza’s bakeries have closed down and the other half have resorted to animal feed to produce bread as Israel’s complete blockade of the coastal territory enters its 19th day. U.N. Secretary-General Ban Ki Moon alarmed at the escalating humanitarian crisis called incumbent Israeli Prime Minister Ehud Olmert last week and demanded that he lift the blockade. “People in Gaza are waiting in lines for almost everything, and that’s if they’re lucky enough to find something to wait for,” says Bassam Nasser, 39. A SCOTTISH human rights activist has filmed the Israeli navy firing machine guns at unarmed Palestinian fishing boats in the Mediterranean Sea off the coast of the Gaza Strip. Israel’s secret police are pressuring Palestinians in Gaza to spy on their community in exchange for urgent medical treatment, according to a report released today by an Israeli human rights organisation. GAZA (Reuters) – U.N. Secretary-General Ban Ki-moon condemned Israel for using “excessive” force in the Gaza Strip and demanded a halt to its offensive after troops killed 61 people on the bloodiest day for Palestinians since the 1980s. Eating weeds and herbs was often the only thing that kept people alive in prison camps. Israel turned Gaza into one big concentration camp. Why is there no help? Look who rules the world and what interests they have, then you know. MADRID, Spain – The unrest that has gripped Greece is spilling over into the rest of Europe, raising concerns the clashes could be a trigger for opponents of globalization, disaffected youth and others outraged by the continent’s economic turmoil and soaring unemployment. Sitting on the stone floor of her bare home in Harare, a Zimbabwean woman poignantly expresses the desperation of millions of Zimbabweans stalked by starvation and disease. Dinner for this woman, whose name is not given in the 15-minute film on Zimbabwe’s humanitarian crisis screened by Solidarity Peace Trust non-governmental organisation in Johannesburg on Tuesday, is a sachet of juice. In another scene, a mother holds aloft a wailing baby, its eyes swollen shut, the skin peeling off its stubby legs. The baby is severely malnourished. The images in the film entitled Death of a Nation, which record the slow strangulation of a population by a government hell-bent on retaining power, were taken between September and November this year. They show a failed state where women in rural areas pick through withered trees for berries to keep their families alive because they can no longer afford a bag of maize meal. And families telling of how they spent the day holding up a drip in an overcrowded clinic for a relative infected with cholera only to watch them die for lack of medication. Over half Zimbabwe’s population of 12 million cannot adequately feed itself, stratospheric inflation means a tub of margarine costs US$9.65 and hundreds are dying of cholera, an easily preventable disease. 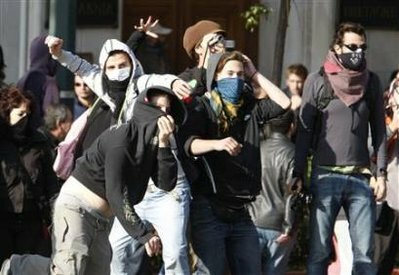 (CNN) — Youths have rioted on the streets of Athens and other Greek cities for the past three days. Stores and cars have been torched, barricades erected and rioters have fought running battles with police. 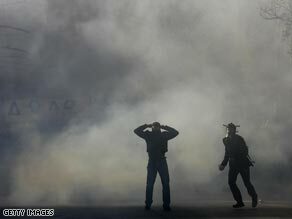 Athens riot police come under attack near the capital’s main police station Sunday. The unrest came after police shot dead teenager Andreas Grigoropoulos, 15, who they allege was about to throw a fuel-filled device at them as a gang of youths pelted a patrol vehicle. What has been the political reaction to the unrest? Read moreExplainer: Why is there unrest in Greece? ATHENS, Greece (CNN) — Violent clashes between police and protesters erupted for a third day in Greece Monday as anger over the fatal police shooting of a teenager continued to rage through major cities. 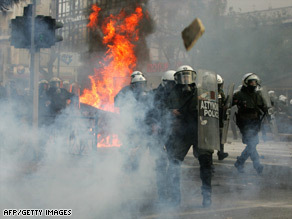 Youths clash with police near the main police station in Athens on Sunday. 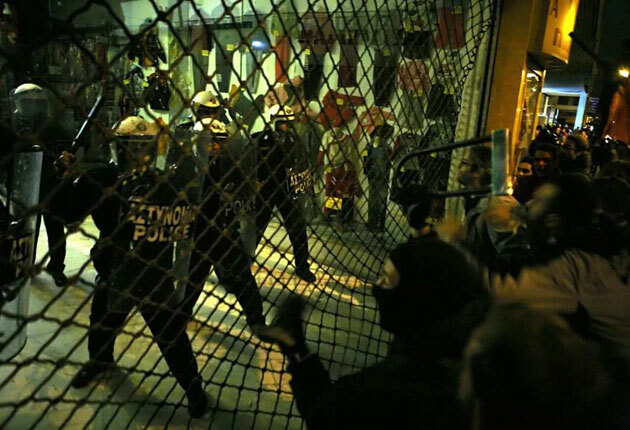 Riot police fired tear gas at youths attacking shops and a police station in the port city of Thessaloniki, The Associated Press reported. Running battles also broke out in Veria, a town 60 kilometers (40 miles) west of Thessaloniki, while violence was reported in the central city of Trikala, AP said. Major protests were expected later in five Greek cities, including Athens, Thessaloniki, Larissa, another central city, and on the island of Corfu. There were scenes of destruction across the Greek capital after police apologies and the arrest of two officers in connection with the shooting failed to halt unrest on Sunday. Residents of one apartment building in central Athens were evacuated on Sunday after angry demonstrators torched a car dealership on the basement floor. One officer has been charged with manslaughter over the killing of Alexandros Grigoropoulos, another as an accomplice. The men say they fired warning shots as Grigoropoulos was about to throw a fuel-filled device at them and a gang of youths pelted a patrol vehicle. A SILENT tsunami of hunger is engulfing the world, afflicting nearly a billion people in 60 countries and killing 25,000 men, women and children every day. The global food crisis, triggered by high prices, shortages and bad weather, is deepening as the world’s economy moves into recession. Millions more people are now facing poverty, starvation, disease and death. The World Bank is predicting that 967 million people will now go hungry in 2008, 44 million more than in 2007. That means that almost one in every six people on the planet is not getting enough food to stay healthy. Children’s growth is being stunted, immune systems are being destroyed and fatal diseases like diarrhoea, measles and malaria are spreading. “This is a tragic loss of human and economic potential”, says a report from the World Bank. The World Bank also estimates that 2008 has pushed 100 million more people into serious poverty, making it more difficult for them to afford life’s essentials. Some 2.3 billion people worldwide have to manage on less than the equivalent of £1.35 a day. CHICAGO — Workers who got three days’ notice their factory was shutting its doors voted to occupy the building and say they won’t go home without assurances they’ll get severance and vacation pay they say they are owed. In the second day of a sit-in on the factory floor Saturday, about 200 union workers occupied the building in shifts while union leaders outside criticized a Wall Street bailout they say is leaving laborers behind. 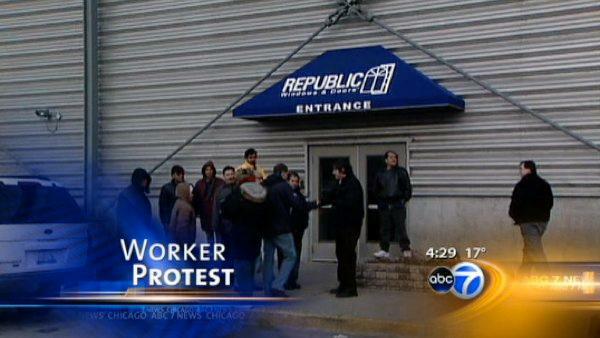 About 50 workers sat on pallets and chairs inside the Republic Windows and Doors plant. Leah Fried, an organizer with the United Electrical Workers, said the Chicago-based vinyl window manufacturer failed to give 60 days’ notice required by law before shutting down. During the takeover, workers have been shoveling snow and cleaning the building, Fried said. “We’re doing something we haven’t since the 1930s, so we’re trying to make it work,” Fried said. At first sight, the man and three women who entered the Harry Winston store in Paris resembled the sophisticated international clientele who frequent this most exclusive of jewellers. But staff soon realised something was amiss – the women were really men in wigs and dresses and all four were holding guns. They herded the 15 or so staff and customers into a corner – hitting some over the head – then loaded necklaces, brooches, watches and other valuables into their bags and made off with a haul valued at €85 million (£74 million). The biggest robbery in French history, and the second-biggest jewellery theft in Europe, took only 13 minutes. French police, who arrived 15 minutes later, said that Harry Winston, the self-proclaimed king of diamonds and supplier to monarchs, aristocrats and film stars, had fallen victim to a highly professional and well informed gang. The boutique, on the Avenue Montaigne in central Paris, was closed yesterday and three of the five window displays were empty. Members of France’s elite detective squad searched the premises for clues. They studied security camera footage and the alarm mechanism, which is linked to a centre in Switzerland. Witnesses told police that the robbers had spoken only French. Others said that they also spoke a second language but all agreed on the speed, efficiency and brutality of the criminals, who injured some of the staff, though they did not fire a shot.